Podemos leader Pablo Iglesias in Madrid. Demotix/Jose_Hinojosa. 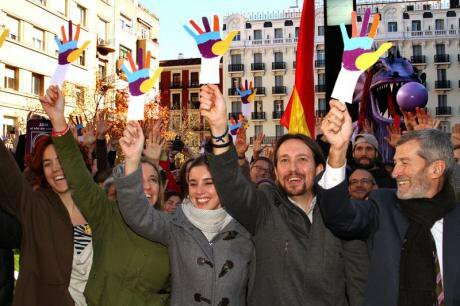 All rights reserved.The contours of Podemos today – a political party that has the ambition to win the general elections in Spain and that already governs in municipalities such as Madrid or Barcelona – are the result of an exciting and complex journey. It was exciting because we were aware of having started to move along entirely new paths, which came nonetheless with having to reinvent ourselves with every step of the way. Specific to the Mareas was their decentralized and leaderless nature, structured around local and regional assemblies which mobilized activists with no personal stakes in the conflict. The journey was equally complex as we set out to open new spaces for political participation within institutions that have for too long turned their back on the real demands of the people. Podemos began when a group of us activists gathered to sign a basic manifesto called Mover Ficha (‘The Next Move’) bringing together around thirty activists from the different areas of education, health, housing, immigration, culture, ecology, etc. Many of us were coming from previous movements, the so-called Mareas (‘The Tides’), which came into existence as a result of the immense explosion of dignity that characterized the 15M movement (15 May 2011). In a spontaneous and unexpected way, 15M represented a radical change in the configuration of social struggles and movements in Spain. Parallel to this explosion of indignation, we see at this time the birth of the Mareas as key instruments in the struggle to defend public services in education, health and housing. From the start, the Mareas focused less on the worker and more on the workplace, emerging as movements that explicitly set out to go beyond the ambitions of traditional labor organizations, to fight for the workers’ demands in favor of a much broader agenda of denouncing the dismantling of the system of social protections, making broad claims in defense of the common good and what belongs to us all. The Mareas directly set out to interpelate the totality of the citizenry, condemning the loss of their social rights and stating the irreducible value of ‘the common’ - now under threat from the measures intended for the destruction of key public services. Specific to the Mareas was their decentralized and leaderless nature, structured around local and regional assemblies which mobilized activists with no personal stakes in the conflict. In this sense, they were movements that aspired to and called for the citizens’ re-appropriation of the public. Podemos took root in these very movements that, despite their vigor and ample scope, found themselves facing institutions completely closed off to the demands of the citizenry. Podemos’ best chance to access the institutions was building on the wide legitimacy of these movements, acquired through intense struggles to regain the support of the street; its best bet was thus transforming itself from a decentralized and self-managed movement into a party-formation, without losing either the movements’ participatory base and broad demands in defense of the public services that, at the same time, strongly denounced the austerity measures of the Troika. Podemos’ plan was moving from the absolute horizontality of the movements – given by its leaderless, anonymous form – to building a strong capacity for leadership that would enable it to participate successfully in the electoral game, a space with rules and dynamics entirely inimical to the logics and trajectories of the movements from which it emerged. Podemos was nonetheless looking for a form of leadership capable of coexisting with the Mareas’ horizontal, participative and transparent forms of organization and self-management. Squaring this circle was from the beginning and continues to be one of the greatest challenges for Podemos, a struggle encapsulated by the squared circle as symbol of the party itself. Squaring this circle was from the beginning and continues to be one of the greatest challenges for Podemos, a struggle encapsulated by the squared circle as symbol of the party itself. Specifically in the field of education, Podemos followed from the start in the footsteps of the Marea Verde, that sprung up in defense of public education, by attempting to voice the consensus that arose from diverse ‘platforms’ of teachers, family associations, students, and the general public. It strongly opposes these practices with a keen awareness that the future fabric of our society fundamentally rests on today’s model of education. Faced with the rise of selfish individualism, the depletion of social resources and rights, and the social polarization of a mercantilist and competitive model of schooling, Podemos proposes a model promoting inclusion, diversity, collaboration and openness to the community as fundamental to its success. In the face of a predominant education model that tends to reduce it to a business, seen as a drain on the public services, making the middle classes pay for (partly) state subsidized private schools, Podemos fights for a public, free and secular education. In the face of an educational policy that conceives of the school as a company that simply trains students for the workforce, Podemos emphasizes the vital necessity of the political, civic and personal development of students. In the face of a school system dominated by externally imposed results-driven modes of evaluation, Podemos recovers the values of a learning process that adapts to the unique needs of every student. In the face of an education system that classifies students on academic or socioeconomic levels, Podemos aspires to create diverse and multicultural educational centres and courses, ones better placed to reflect the globalized world we now live in. In the face of schools that focus on the students’ need to accept and adjust to a social, economic and productive reality that exposes and exploits the limits of our planet, Podemos aims to train students to look for its ongoing transformation, creating minds able to critically determine and reflect on what exactly and how much we need to sustainably produce. From the very beginning, Podemos has been a challenge, a loud protest for dignity that calls into question the process of involution taking place in Europe today, and an invitation to take charge of our lives and make politics what it was always intended to be: an open space for the management of the common affairs that concern us all.